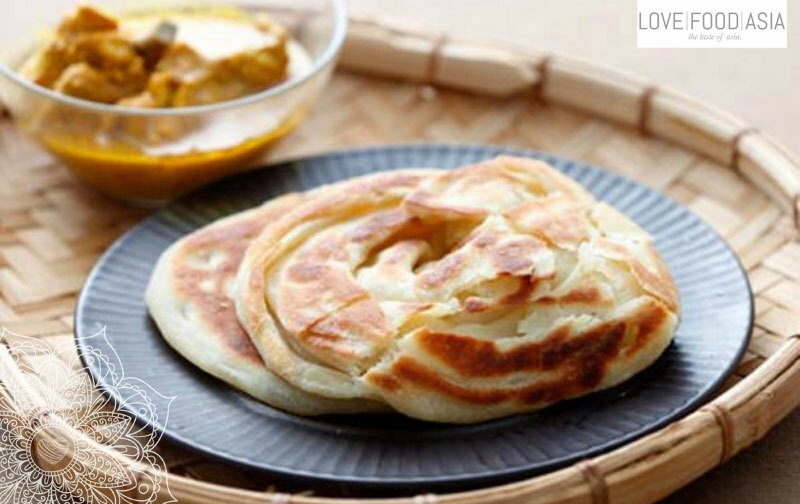 Roti Prata is a well known side dish in Southeast Asia. Especially in Singapore, Malaysia and India you can find this delicious bread. This roti is mostly eaten for breakfast and can be found in one of the food stalls of Singapore. It is a different kind of Roti. It will take some time to prepare the dough but it is absolutely worth it. Add plain flour, salt and sugar into a mixing bowl and mix well. Add water, eggs and corn oil into mixture and mix till sticky clumps form. Set aside for 30 minutes. Knead dough by hand for 10 minutes till it becomes firm. Place dough in a bowl and cover it with a damp cloth. Set aside for 30 minutes. Knead dough for another 10 minutes and divide into 100g portions. Roll each portion into a ball. Coat each ball with a layer of oil to prevent them from sticking together. Place dough balls on a tray, cover with cling wrap and refrigerate overnight. When ready to cook, remove tray from fridge and let dough sit at room temperature for 10 minutes. Oil a flat surface and flatten a ball of dough with your palm. Hold two edges of the dough anchored by your thumb on the front and four fingers on the underside (below). Flip it in a anti-clockwise direction , rotating the dough six to eight times till it becomes well-stretched and thin. Once it is stretched out, fold the edges outwards to ensure uniform thickness at the sides. Coat the surface of the dough with 1/2 tsp of corn oil. Fold the dough inwards from the four sides till they meet in the centre. Repeat the last steps for the remaining dough balls. Add 1/2 tsp of corn oil to a non-stick pan on medium heat till the oil sizzles. Place folded dough in the pan with the seams facing upwards. Fry for one to two minutes till it turns golden brown on each side. Use a spatula to press down sides to ensure that they are cooked. Cool for one minute before fluffing up the roti prata by pressing the sides towards the centre in a quick clapping motion. Serve with Curry or for breakfast with eggs and Teh Tarik.